When it comes to irons in the proverbial fire, I have a few. Of course, we are now eleven days from the kick off of National Novel Writing Month, or NaNo as the Pros from Dover call it. I, like half the fiction writers in the World, have spent countless recent hours preparing, making sure I’m ready to get my game face on, trying to remember where I packed my game face, wondering if it still fits, rifling through numerous boxes in the crawlspace upstairs that is our attic looking for the game face, executing repairs on said game face–made necessary after the time during last year’s NaNo when I chucked the game face across the room in a fit of reprehensible, unadulterated frustration. And I’m working on a post with all the details for how I’m playing NaNo this year–but if you’re impatient, you can click on my sidebar and check out my profile. If you’re looking for a NaNo writing buddy, let me know. The more the merrier is my motto. Also, Sommer Leigh has put together a linky tool so we can champion our fellow writers doing Nano. Check it out–and sign up if you’re in. BTW, are you in? (Plus, don’t forget, Monster Fest 2011 runs through the end of the month. There’s still plenty to see and do over there, so don’t miss it!). But now to the real business of the day: Part three of the #REN3 Blogfest. This has been a ton of fun to write, and to also get around and read everyone else’s stories. Don’t forget to check back for the finale next week! Prompt: Betrayal is in the air. “Ok.” Calvin turned to leave. Calvin reached for the files. They hiked up the path, making the final turn into the clearing. Calvin led, Theodora followed. “Wow!” Theodora lifted her sunglasses. “You weren’t kidding. This is some view.” All of Renaissance was visible: Old Town; the Schiavona Desert; the River Espadon. But scads of strip malls had materialized over the last few years, disfiguring the landscape. Near the trailhead, they unearthed an archaic sign with rusted letters: “Renaissance–Pop. 333”. Calvin pitched it aside and sat down. Calvin didn’t speak, his eyes on the horizon. “–I think I’ll be going.” Theodora zipped her pack and started down the trail. They stood face to face, staring at each other for what seemed like forever. Calvin blinked twice. Theodora gazed at him through her sunglasses, waiting. Finally, Calvin ran one hand through his auburn hair and chuckled. The situation suddenly felt silly, absurd. She walked after him. The guttural crunch of gravel beneath their boots rang in her ears. She gazed out to the horizon, troubled. Had she said too much? A Daft Scots Lass said, what a great slogan. Kurt Hartwig said, I've totally missed the first two installments – glad this 'fest is going on long enough to be able to catch up finally. And hooray for tweeting the #ren3 tag as well. I feel like you're setting us up for a big twist (leopard can't change his spots), but between the two obvious choices, Calvin and Magnus, I'm not sure which one is the more likely leopard just yet. Nor am I convinced that those are the only two candidates. Fun reading! Lola Sharp said, Wow, so much good stuff in one post, JP. 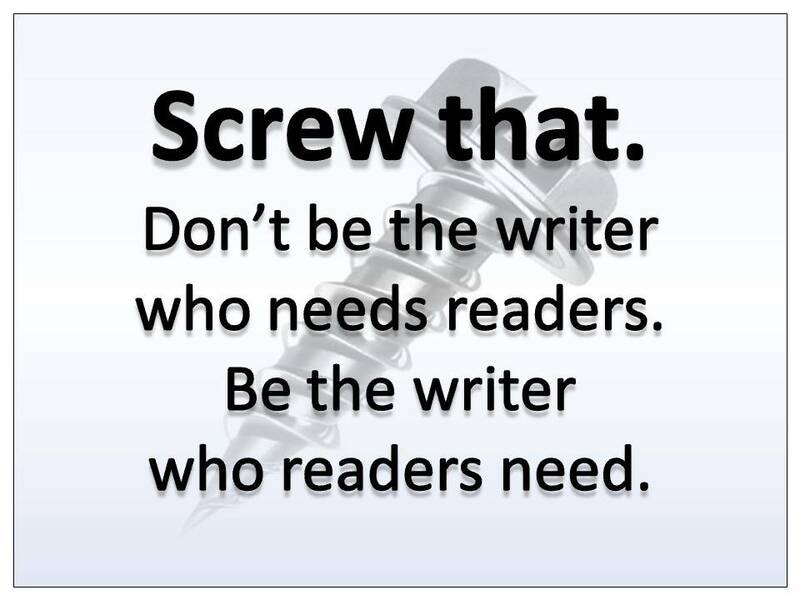 Love the Be the Writer who Readers Need. I'm excited about Nano. I hope you find your game face, mister. Thanks for the plug for my interview with Hilary. And I enjoyed your installment. Joshua said, I'm sad there's only one post left to wrap things up. Toyin O. said, Really enjoyed this, thanks for sharing. David Powers King said, As others have said, that's a great quote. And your installment felt very natural. Loved the conversation and Theodora's conundrum at the end. I'm piqued for next week! BornStoryteller said, It felt like he had something else he wanted to say. Misha said, I hope Theo is wrong. Calvin is a really nice character. Kurt–This 'fest has been great, hasn't it?! And yeah, I need to get around and catch up on my reading myself. Lola–Looky what I found. *holds up game face* 😀 Have a fine weekend yourself. Joshua–Yeah, me too. I've become attached to these characters–so I may flesh things out and turn this into a full-blown short story. We'll see. David–Next week is when it all comes together (I hope :D). Thank you, all you fine people for stopping in. Have a super groovy Weekend! Donna Hole said, This just keeps getting deeper. But I've a feeling Calvin is harboring a "secret" that will save him. Hope so anyways. I'm not in NaNo – I'm just not dedicated enough to write that much. I'd have to take time off from work I'm sure to compete. But, I'll be in your support group, encouraging you to keep writing and keep your game face from becoming too wrinkled (lol). I'm looking forward to seeing how you resolve this issue for Calvin. Have a good weekend JP. Jon Paul said, Lisa–You're right on a challenge to finish. I have a good sense about how things will end, but I'm struggling to stay within the word limit. I too must get around and read more of the stories. Donna–NaNo will be a challenge this year, but I think I'm up for it. Plus, stay tuned for an announcement from me later today. I have a little mischief planned for November–and would love if you (along with everyone else) played along. NaNoWriMo participation not required!